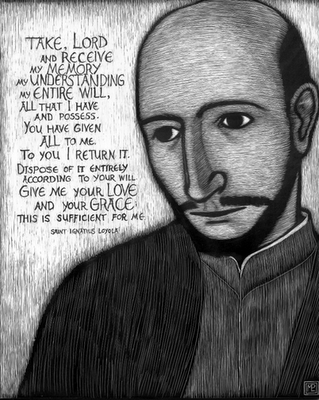 Today is the feast day of St. Ignatius of Loyola. This prayer is a goal that we should all strive toward. It is all about doing. Ignatius understood the call to follow Jesus and imitate his way. In a day in age when we are fixated on discussions about what we believe, let us remember a saint whose life and witness was a reminder to do the work of Jesus – be generous, serve, give, fight, work, labour… let us be the church by doing the will of Jesus of Nazareth. It is good to be reminded that we are called to be a people of love and service and to come to understand that love and service are embodied in what we do and not what we say. Let us look for places to be the Love that God has called us to be. Thanks for providing us with such a lovely prayer that shows/teaches again what it means to be a follower of the Lord. The old axiom, “Actions speak louder then words”, is most appropriate here. St. Ignatius played an notable role of doing, in the history of the Church.